A group of Seattle corgi owners dressed their dogs in costumes for a walk around Green Lake this morning. Our corgi Zeus missed this. We didn't know about it, but we don't walk around parks on Sunday mornings anyway. The Seattle Times has eight photos. 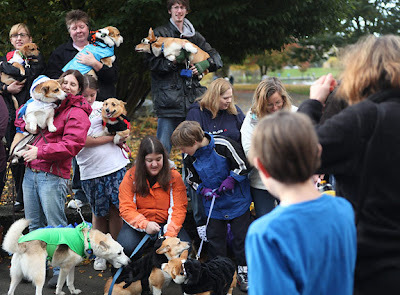 I wish I had a place around me where everyone walked their dogs with costumes on. Last year I dressed my 2 dogs up as boxers last year for Halloween. We made boxing shorts out of mens boxers and made little boxing gloves and put them around their front paws. Whiskey was Manny Pacquiao and Max was Floyd Mayweather. They were a big hit. Thanks a lot for this beautiful post.i'm a big fan of boxing.i;ve a fan blog based on Bradley vs Marquez fight.it's so interesting,exciting & enjoyable.if you want,you can visit:http://marquezvsbradleyfight.net/ & get more entertain with news.